Way to go Sky! And Debbie! What a wonderful story and we so enjoy seeing the updates from you both too! What a handsome boy Sky has turned out to be - a long ways away from that sad little pup you sent us white German Shepherd puppy pictures of years ago! 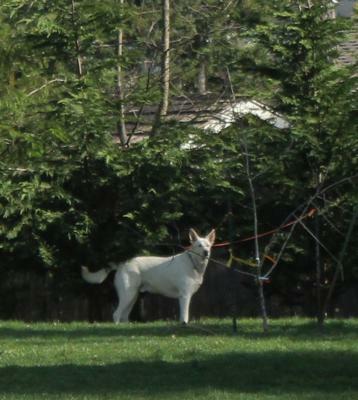 He is definitely one good looking white German Shepherd Dog! I wish more people had the opportunity to do exactly what you have done here with Sky, Debbie, because if that were the case just imagine how many other dogs could be taken out of shelters and other bad situations and placed in loving and forever homes. And to reward their rescuers with years of loyalty, friendship and love! Truly a win win for all involved don't you agree?! So continued success with Sky - maybe the next time you send us a picture you can send us one where we can actually see that pretty face a little better. He is truly a lucky GSD and you are one lucky white German Shepherd Dog owner! "Sky the Rescued White German Shepherd"
Sky is a pretty boy and big too! You give him a loving home and he is happy and healthy. Good for both of you. Look at his picture he doesn't look afraid, he is standing there taking it all in. Take care of your boy and he will take care of you!